As people get older it is common for them to experience certain medical problems. One of the more frequent ones is a bulging disc. This happens when one of the discs of the spine bulges and puts pressure on a spinal nerve or the spinal cord itself. This can lead to back pain as well as other symptoms. The most common places where a bulging disc can occur are in the lumbar or the lower back area. This differentiates from a herniated disc as the disc herniation can occur suddenly as a result of trauma or an injury while the bulging disc happens gradually over a period of time. For a lot of cases there is no need for surgery. Bulging discs can be treated more conservatively with rest, therapy and anti-inflammatory medication. However, if those methods have proven to be ineffective then the best solution is surgery. While a bulging disc is not a medical problem in of its own, it can cause pain, weakness and numbness in the arms, legs and back. The most common surgery procedure in these situations is the discectomy. During this operation the surgeon will remove part of the bulging disc, thus alleviating the pressure that is exerted on the nerves. Apart from that a lumbar fusion can also be used to connect two vertebrae together. This will also help alleviate the pain in the back and other symptoms. In order to stop or reduce the pain that the patient is feeling from a bulging disc the surgeon must cut out a part of the disc in order to remove the pressure on the nerves. First off, the patient is placed under local or general anaesthesia, depending on where the disc is located. After that an incision is made and then the surgeon penetrates the different layers of muscle and tissue in order to reach the disc in question. Nowadays, small cameras on the end of tubes can be used to make more precise incisions as well as speed up the recovery process. Once the disc is located a section of it is removed which should stop the back pain. After this the section is replaced with a prosthetic or the remaining sides are fused together. The lumbar fusion is generally the most recommended procedure, although it can weaken the discs above and below the fused portion which, in turn, will require further surgical procedures. Patients can also expect to lose some mobility in their back after such a procedure. An operation to treat a bulging disc is usually covered by the NHS, along with less invasive treatment options. Those that wish to turn to a private clinic for surgery should only use those that employ experienced and reputable surgeons. Clinics like Spire Health Care and Nuffield Health will charge around £10,000 to £12,000 for bulging disc surgery. 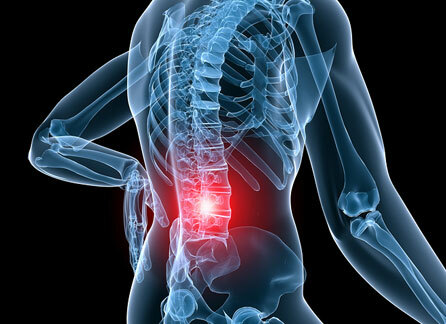 If you suffer back pain from this type of problem it is normal to get it fixed. However, you should exhaust other alternatives before you resort to surgery.